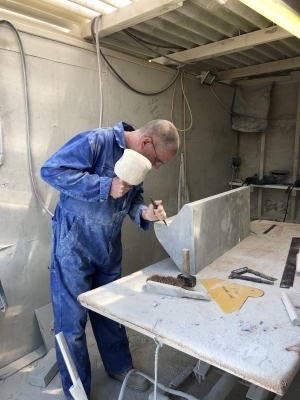 The craft of the stonemason is very ancient. If you had been down at All Saints Church in 1100 AD when the church was under construction, or 1523 when the tower was first built, or 1875 when the new bells were added, you might have seen a small group of industrious craftsmen, hewing and chiselling stone, standing precariously on scaffolding, lifting the new blocks into place and cementing them in. But if you had been down at All Saints over this last summer, you would have seen exactly the same thing! Almost. The patient workmen, the sound of steel on stone and the huge blocks being manhandled, would be the same. Only the van in the carpark and the electric cables would tell you which century you were in. 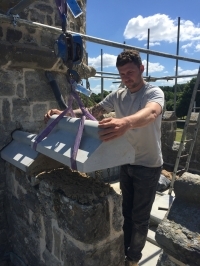 During this summer, fundamental repairs have been made to the stonework of the tower, the vestry and the roof, by Steve Hill and his company of craftsment, Pinnacle Stonemasons. 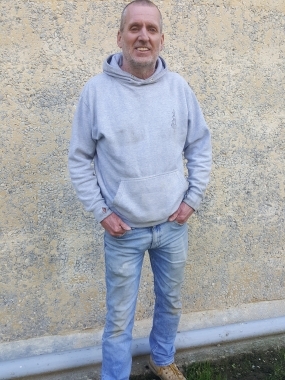 We interviewed Steve down at the church when the job was almost finished. Q: Steve, what was wrong with the stonework? 1. 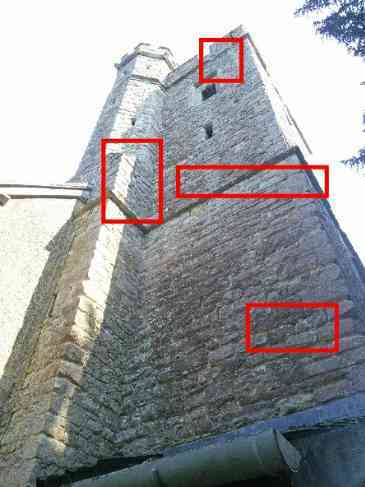 Damaged and eroded ragstone up the side of the tower. 2. The eroded stonework at the top of the tower - an old brick chimney - and a tree growing out of it! The crenellations and the little round turret on top of the tower were quite worn away and in bad condition. It's all quite daunting. We wondered how long it takes to learn about stone. Q: Steve, is it hard to become a stonemason? How did you get into this trade? A: When I left school, I got a youth opportunity job at York Minster. There were 15 masons and 15 carpenters permanently employed there, maintaining the building. I stayed there 7 years. And then I got a chance to study in Venice, at the San Cervolo Centre for craftsmen. I studied there for 6 months. Q: And that was it? You were an expert then? A: Not exactly. Then I came back to England and worked as a banker. A: It's the name given to a self employed stonemason. You have your own tools, hammer and chisel. And you move around from site to site, wherever there is work. I did that for years. I worked a lot in the West Country. Q: I see. And what about Pinnacle? When did you start that? A: That was 3 years ago. Q: Is this one of the biggest jobs you've done? A: No. We do a lot of work on churches. Recently, St Mary at Dover. And St Mary the Virgin at Stanted, where we rebuild some of the buttresses. St Margeret at Dover, lots of stonework there. And next door, we did a lot of work at St Peter and St Paul at Yalding, taking out the ferramenta - that's the iron bars that support windows - and replacing them. Q: What was the hardest thing about this job? A: Well, the tower of All Saints is kent ragstone. Candidly, it's a horrible stone to work with, much harder than the British limestones like Portland. It's hard and dense. And chips. Q: It's amazing to me that the original builders were able to work it at all! A: In those days a stone yard would have had stonemasons and full time blacksmiths on site, always busy. The chisels and saws would become blunt in 5 to 10 minutes. Then it was back to the blacksmiths to be sharpened. A: Nowadays we have diamond tipped angle grinders, the edge last longer. 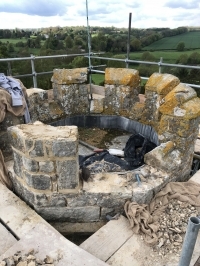 Q: So the ragstone was the most difficult thing about the job? A: No. The most difficult thing was the render. The coating of small stones, sand and lime which protects the stonework. Q: I thought that was something the Victorians put on? A: No, it's been there since day 1. See, the walls themselves are made of stone, almost rubble in places, with bits of flint stuck in as well. The joints are wide, not completely filled. The render is absolutely necessary to protect the materials behind. 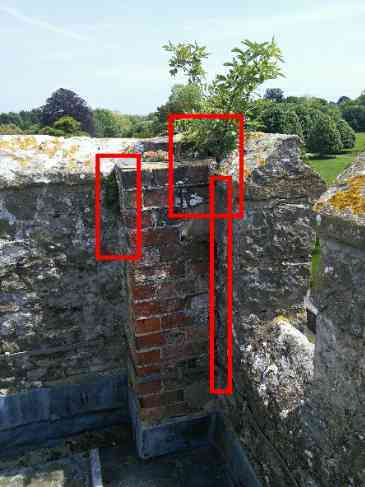 Otherwise it would erode the soft tufa stone of the main walls, rapidly. 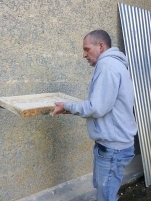 Q: Is tufa stone with render better than cut stone blocks? A: No, it's just a lot cheaper to build! Q: So what was hard about replacing it? A: We don't have the original recipe for it. And we have no records about how they put it on. Right from the beginning, I was convinced they filled rectangular panels. You put the little stones in panel first and then the lime mix. 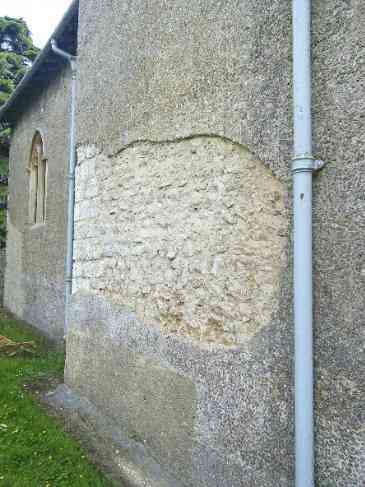 When you present the panel to the wall, the stones are then on the outside. In some places you can see lines in the original render, but not everywhere. I think when they put it on, the most skilful workers left no lines. So we did a trial with approval from Derek Hudson, the architect. We covered the north chancel. But it was the wrong colour. Q: But wouldn't you expect that? The old render is a hundred years old. Or more. A. That's right. So the new render should probably be a different colour, to start with, even if we've got it right. We think we've got close. It's been a journey and a lot of rework. Well, Steve, the church looks wonderful now. Thank you and your Pinnacle craftsmen so much for what you've done. This is fascinating, thanks for investigating and sharing.